HÀ NỘI — A video competition, titled Australia-Unlocking potential, has been launched for students studying in Australia and Australian alumni in Việt Nam. The competition, hosted by the Australian Embassy in Việt Nam, with prizes sponsored by NTStudy and Charles Darwin University, will offer students the opportunity to tell their story on how Australia transformed them, how they stepped out of their comfort zone and experienced new things in Australia and how they have used or would like to apply these experiences upon returning to Việt Nam. “The embassy has run several competitions for alumni to exchange stories, which includes photo and writing contests. On this occasion, we want to give alumni the opportunity to tell their story in a more dynamic and creative way, through video,” Australian Ambassador to Việt Nam Craig Chittick told Việt Nam News. “We believe the competition will encourage alumni to challenge themselves through a new way of self-expression/story-telling, as well as master filming and editing skills, which could be useful in work and in life in the digital era,” he added. “This competition will encourage alumni to tell their story about how they have been transformed by their Australian education. We see it as not only an opportunity for alumni to share their memories of Australia, but also, we hope, to inspire current and prospective Vietnamese students in Australia,” the ambassador said. Up to six best videos will be awarded, including the first prize of AU$1,000 (US$750) in cash, second prize of AU$500 in cash, third prize and three popular choice prizes. 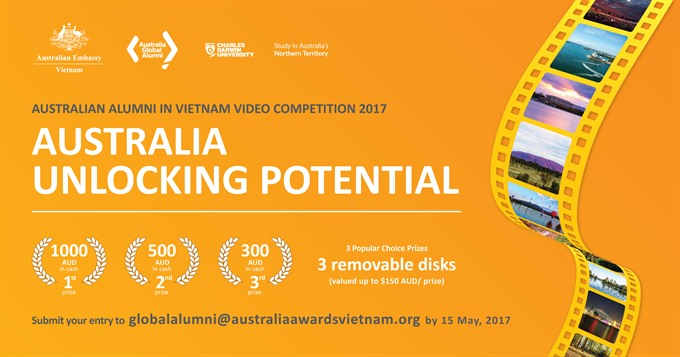 The competition is open to all Vietnamese students in Australia and Australian alumni who have returned to Việt Nam, regardless of their video-making experience and skills. This competition is an opportunity for them to tell their unique story by combining videos and photos that have been taken by a video recorder, a camera or even a smartphone. The deadline for submitting the video is May 15, 2017.